The Christian genocide in Ottoman Turkey lasted for 10 years — from 1913 to 1923 — and targeted Armenian, Greek, Assyrian and other Christians. It resulted in the annihilation of around three million people. Sadly, Turkish aggression against the remaining Armenians continues. “The lies and state propaganda, which hold the victims responsible for their own annihilation, are what enable the ongoing Turkish persecution of the country’s remaining Armenians, including the conversion of their churches into mosques and the digging up of Armenian graves and churches by treasure-hunters who search for gold”. The Turkish government must stop. 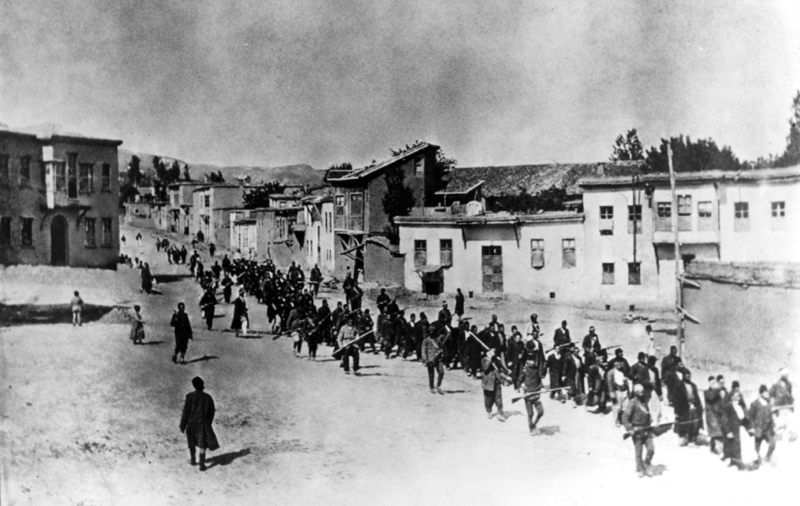 Armenian civilians, escorted by Ottoman soldiers, marched through Harput to a prison in nearby Mezireh (present-day Elazig), April 1915. Mustapha Kemal’s Army … celebrated their triumph by the burning of Smyrna to ashes and by a vast massacre of its Christian population. Now Erdogan, with the characteristic Islamic supremacist evasion of responsibility, blames the Greek Army for this atrocity. Turkish President Recep Tayyip Erdogan claimed Greek soldiers burned down the coastal city of Izmir as they were retreating in 1922, at the end of the Greek-Turkish War, as he kicked off his general and presidential election campaign rally in the city on Saturday. Erdogan claimed Turkish soldiers “did not want to destroy or burn – they always wanted to build and create,” which is evident by the rapid development of the city after the war…. The lies and state propaganda, which hold the victims responsible for their own annihilation, are what enable the ongoing Turkish persecution of the country’s remaining Armenians, including the conversion of their churches into mosques and the digging up of Armenian graves and churches by treasure-hunters who search for gold. The annual Armenian Genocide commemorative event that the Istanbul branch of Turkey’s Human Rights Association (IHD) and the European Grassroots Antiracist Movement (EGAM) planned to hold on April 24 — which they have been holding every year since 2005 — was blocked by police, who seized the placards and banners about the genocide and carried out criminal record checks on participants. Three human rights activists were detained and then released. “At the root of all evils in this country lies the genocide committed against the Christian peoples of Asia Minor and Northern Mesopotamia, against Armenians, Assyrians and Greeks. Sadly, Turkish aggression against the remaining Armenians continues. On December 28, 2012, an 85-year-old Armenian woman named Maritsa Küçük was beaten and stabbed to death in her home in the neighborhood of Samatya, one of the largest Armenian communities in Istanbul. The Christian genocide in Ottoman Turkey lasted for 10 years — from 1913 to 1923 — and targeted Armenian, Greek, Assyrian and other Christians. It resulted in the annihilation of around three million people. Although a century has passed since then, it is still a bleeding wound for the victims and their descendants. The online newspaper Artı Gerçek recently reported that the bones of victims are still visible in a lake in in eastern Turkey. Locals named the lake “Gvalé Arminu” (the “Armenian lake”) after the massacre of more than 1,000 men, women and children that took place there 103 years ago. According to the report, only two children, hidden by villagers, survived. Even the bones that are revealed when the lake dries up in the summer have not led to an investigation by Turkish government, which continues to deny the genocide and attempts aggressively to silence those who try to speak out about it. On April 24, the government-funded Anadolu Agency (AA) ran a storyheadlined: “The source of Income of Armenian Lobbies: the Genocide Industry,” alleging that the Armenian diaspora and the republic of Armenia make false claims about “the Armenian genocide lie” for financial gain. On the same day, the AA ran a separate story: “Turks recall escaping from Armenian oppression.” According to Turkish myth, it was actually the “treacherous” Armenians who persecuted Turks; and the Turks were acting in self-defense to rid themselves of murderous Armenians. A widespread Turkish claim is, “They deserved it”.